Please join representatives from the Australian, New Zealand, and Turkish community in commemorating the Australian and New Zealand Army Corps (ANZAC) landings at Gallipoli on 25 April 1915. 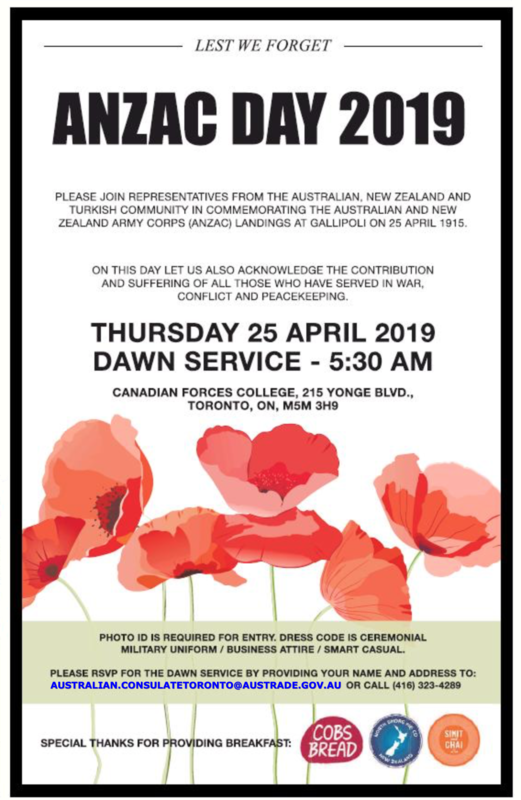 The ANZAC Day Dawn Service takes place on Thursday, 25 April 2019, at 0530 hrs, at the Canadian Forces College at 215 Yonge Blvd., Toronto, Ontario. Photo identification is required for entry. Dress code is ceremonial military uniform, business attire, or smart casual.